SUN Behavioral Health is a national provider of behavioral health services. 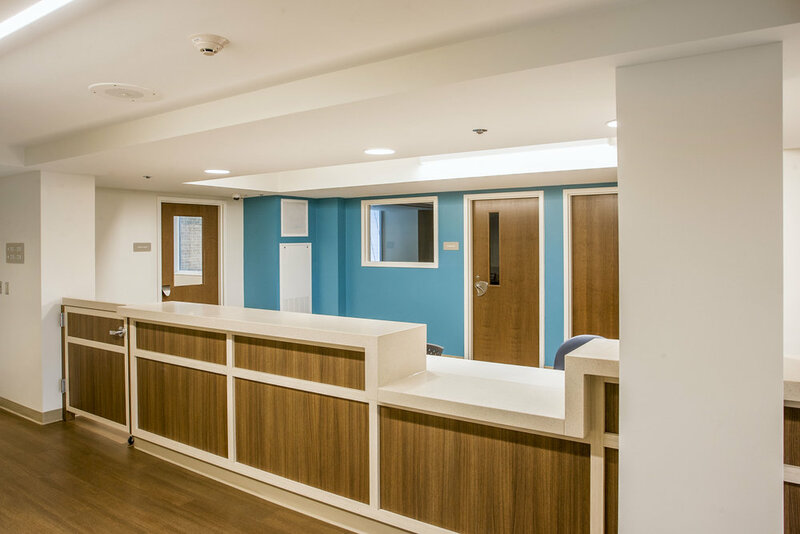 NK Architects has been working with SUN and St. Elizabeth on numerous Behavioral Healthcare projects around the country for many years, including projects in Texas, Delaware, New Jersey, Kentucky and Ohio. On a mission to partner with local communities to solve their unmet behavioral health needs, SUN improves psychiatric services by providing compassionate and respectful care in order to save lives and enhance the quality of life for their patients and families. 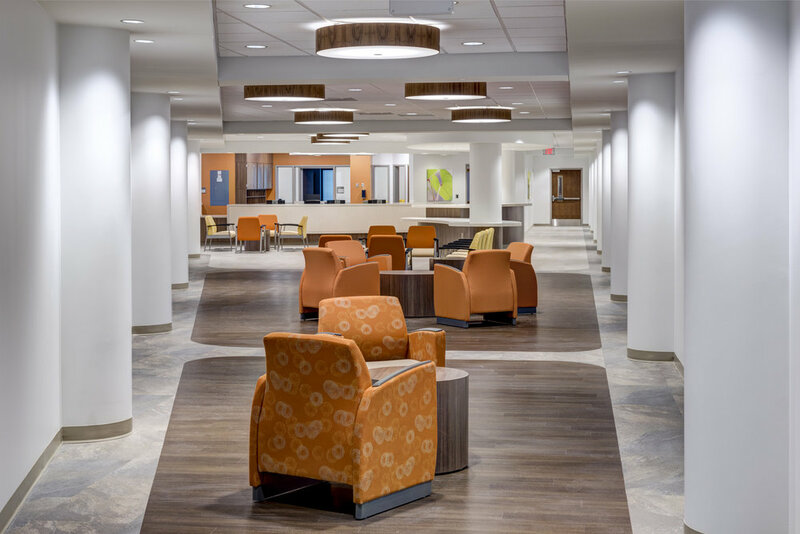 In response to a great need for beds in the Columbus region (where patients were waiting days in emergency rooms for mental health services), NK Architects worked with SUN to convert an existing hotel and conference center into a fully functioning psychiatric center. The facility was comprised of two buildings, a swimming pool building, and a restaurant. The second through fifth floors of the guest room building were converted into resident room inpatient units in both semi-private and private rooms, totaling 144 beds. Support spaces included a central social day space, nourishment space, quiet activity space, seclusion rooms, nurse stations, conference/charting/planning spaces, laundry rooms, and visitor/consult rooms. 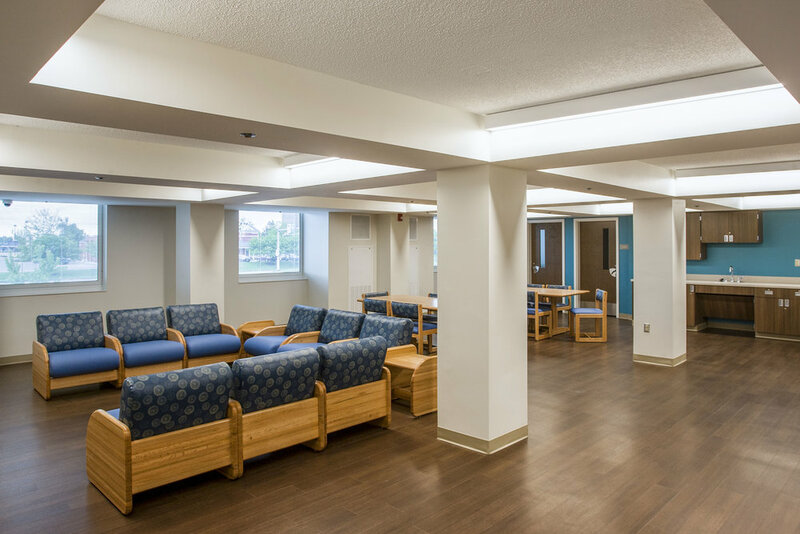 The first floor was renovated to house admissions, assessment rooms, group rooms, dining, and patient storage, as well as administrative offices and staff areas. The existing swimming pool was transformed into an indoor recreation center for use by the patients, who can be observed from adjacent staff spaces. The outdated restaurant was upgraded structurally and renovated into an elegant dining hall and visitors’ area.